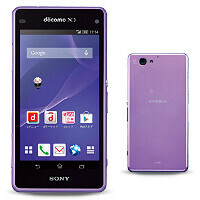 The Sony Xperia Z1 Compact for the Japanese carrier NTT DoCoMo is titled Z1f there, and codenamed as SO-2F internally. Today DoCoMo started taking preorders of some Xperia A2, which is coincidentally coded as SO-04F. The Xperia Z2 is marked as SO-03F by the carrier, but the specs of the A2 don't really scream Z2 Compact, as was thought before. The specs seem to be more similar to the Z1 Compact, rather than being worthy of a Z2 Compact, as the A2 sports a 4.3" 720p LCD Triluminos display, a 2.2 GHz quad-core MSM8974 Snapdragon 800 processor, 2 GB of RAM, and Sony's 20.7 MP camera sensor on the back. This looks like a carbon copy of the Z1 Compact specs, though the dimensions are a bit different, at about 128 x 65 x 9.7mm, against 127 x 64.9 x 9.5 mm for the Z1 Compact. We also aren't seeing a speaker at the rear of the A1, like on the Z1f. The Xperia A2 phone is still waterproof and IP58-certified, but the ability to record 4K video is conspicuously missing from the list of virtues that comes with the handset, while its larger sibling, the Z2, brags and boasts with this functionality. It is available in a couple of bold new colors, for that matter, including lavender and orange, and will be hitting the shelves in mid-June. It is a small fail for Sony marketing/branding though. They should have called this refresh of the Z1c something like Z1cs. Using "A2" makes people think of the "Z2". Now in Japan, the story may be different, so this marketing blooper may not really matter. Hopefully Sony can get the Z2c over to the US officially and more quickly than the slow dance of the Z2 across the globe. If it's the same specs as the Z1 compact why release at all? Wtf is sony smocking? It should've upgraded to 1080p & SD801 Soc. it's a z1c refresh. NOT z2c. like z1s for t mobile. 4.3"+1080p... Since when does the human eye ever need 512 PPI??? Since there was a human eye. Contrary to the ignorant mythology that pervades the internet, the eye can easily resolve 500+ ppi. Keep in mind the eye does not work like some sort of pixel scanner. Anything that you can make more clear, more legible, makes it easier and less strainful for the eye/vision system to recognize. This is especially true on a small screen where the eye has to expend more effort on focusing. Reducing eye strain is one of the main ways of slowing the onset of myopia for people who use small screens a lot. FHD on 4.3? But what for? To decrease battery life? 4.7" FHD would make more sense. For me Z2c should have 4.5 and 720p, maybe FHD if battery was big enough. And I want same IPS screen which Z2 has, it's much brighter. Give me a RED Z Sony! Nope. I'm sure this is a some kind of Japanese carrier special. Thats the docomo Palette UI launcher. It's actually not bad. Sony can't make plastic devices any more beautiful. Plastic just doesn't suit omnibalance design language. PA correction. The A2 is possible successor of Xperia A aka xperia ZR not Z1 compact. I can assure you this is the ZR successor though, it was just a bit watered down than the Z only screen size and res. was changed, and the design is strikingly similar to A2. Hopefully this isn't the Z2 compact because those dimensions are a total fail. It is not. Possibily the successor to the Xperia A. As stated before me this is a successor to the XPERIA A (Japanese ZR) which I am holding in my hands right now. Its their bestselling device ever, and likely will be again. The Z1f over there had a few conspicious things missing such as no 1Seg Antenna, I expect the A2 (despite having similar specs) is a more mass production friendly version. Don't knock the plastic - mine has proven durable, comfortable to hold and uniquely stylish beside other phones around me. Now that I'm home and have scrutinized the A2's product page; YES, it IS a repackaged Z1f. It is nearly identical in layout (just compare images of them), but trades the glass back for a matte plastic finish, while removing the distinct side-inserts. It also does NOT have a 1seg antenna or NOTTV as I thought it might. Losses from the outgoing XPERIA A are the Ambience Light notification bar (sadly!) and the rear panel seems unremovable. Compared to the Z1f though there are the following key differences I could pick out: Bluetooth v5.0 (up from v4.0), likely with aptX Android 4.4 @ launch with some new features, mostly from the Z2: STAMINA mode (yes this is new because JDM XPERIAs did not have them) Emergency Power Saving mode (this differs from STAMINA mode as it really, really turns things off to last as long as possible in the event of a disaster) Simple Homescreen (ala Samsung's Easy) POBox Plus 1.1 (up from POBox Touch) - a new version of their (great) keyboard It's marginally larger, but marginally lighter (2g). It's also got a more rounded frame, which should actually make the slightly wider girth easier to hold. tl;dr: It's a XPERIA Z1f with a plastic back (still alu frame) and the latest Z2 software.